TheTownCrier: Debates trying to ignore Duncan Hunter - see the videos and quotes! Debates trying to ignore Duncan Hunter - see the videos and quotes! It's become obvious that the major networks, including Fox, are globalist sympathisers and have no intention of letting Hunter get his message out about Chinese bad trade deals, immigration and the problems only Hunter addresses. Duncan Hunter after debate interveiw on Fox. "China is cheating on trade"
"I would zero the manufacturing tax on US Manufacturers"
Responding to a hypothetical situation in which people in custody in Guantanamo Bay, Cuba, have knowledge of an imminent terror attack, he said: "This would take a one-minute conversation with the secretary of defense. I would call him up, or call him in, I would say to sec def, in terms of getting information that would save American lives, even if it involves very high pressure techniques, one sentence: Get the information ... and I will take full responsibility." "If we have border enforcement, we will be able at that point to start to regulate the internal problem that we've got, because as long as you've got a revolving door and you have no border - and this 2,000-mile porous border, incidentally, is our biggest homeland security problem. It's not just an immigration problem. It's a homeland security problem." Mark Levin on the debate: "But I am becoming increasingly impressed with Duncan Hunter. He's poised, has a good grasp of the issues, and is consistent. He's solid on national security, and I like his idea about zero taxes for the manufacturing sector. In my own mind, it would be nice if he'd move into the first tier of candidates. " 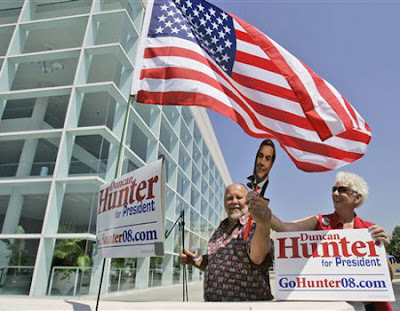 Townhall " Duncan Hunter – Unlike the guys who mention their lame-o backgrounds as governor, Hunter actually has a résumé that you gotta love. Also, I think he comes across impressively. In a better world, he would be a top tier candidate."